Efficient design, development and production operations are the cornerstones of a successful filtration product. At PTI, we understand this better than anyone. 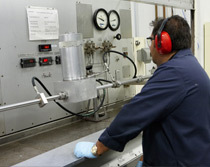 With expert R&D and engineering departments and a complete manufacturing and testing facility, we are uniquely equipped to translate your filtration concept and needs into real performance. With Over 85 years of engineering, development and manufacturing experience, PTI is in a position to provide innovative, cost effective, and advanced products and system solutions for virtually any filtration & fluid flow application. The level of technical sales support and repair services at PTI are unsurpassed. Our engineers serve on industry committees including, SAE International (SAE) , National Fluid Power Association (NFPA), and International Standards Organization (ISO). PTI’s product lines serve a worldwide customer base in a wide range of markets. These include: agriculture; automotive manufacturing; chemical & petrochemical production; commercial and military air, sea and land-based vehicles and equipment; construction & off-highway vehicles; lumber production; machine tool manufacturing; metal manufacturing; mining; nuclear and hazardous waste disposal; oil and gas production; petroleum production; power generation; and pulp and paper manufacturing. PTI currently ranks among the top ten in the worldwide fluid filtration industry. PTI supplies filtration products to a worldwide customer base that includes NASA’s Space Shuttle program and aerospace and industrial giants such as Boeing and DuPont. Other representative customers include: Allison Transmission, a worldwide supplier of automatic transmissions; Aviall, a worldwide distributor of aerospace components and Sojitz Aerospace, a trading representative for OEM’s worldwide to the aerospace & defense industries in Japan. network of authorized distributors provide OEM and interchange filter elements and spare parts throughout the world. development and performance verification of filtration systems and related technologies. 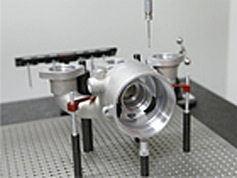 Unique test stands and standard set-ups are used to complete a variety of rating and performance integrity tests to the requirements of MIL-F-8815. 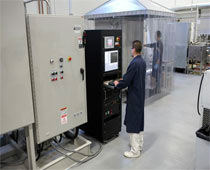 The testing facility is also capable of satisfying unique customer specifications. Systems can be evaluated in either synthetic or petroleum based hydraulic oils, fuels, air and/or water. Lab equipment includes fluid flow test stands up to 5000 psi/100 gpm, computerized multi-pass equipment for filtration rating tests, a cold start test stand for differential pressure tests, and various environmental and structural test capabilities for vibration, temperature and altitude tests. PTI’s technical expertise in the field of fluid filtration has produced several hundred product applications ranging from simple filter elements to complex hydraulic control manifolds. Our comprehensive library of filtration media developed through forty years of relentless pursuit of total customer satisfaction. Our design objective is to deliver robust, successful, cost effective products. The engineering department contains these functions: project engineering, design engineering, reliability and maintainability engineering, test engineering, configuration/data management and logistics. The PTI technical staff serves on industry panels and committees addressing key issues or standards involving filtration. 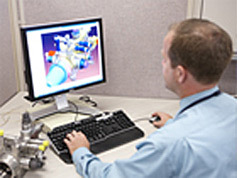 PTI uses PRO Engineer 3-D solids and CATIA Computer Aided Design systems to create filter assembly and hydraulic manifolds and related hardware. This system is an integrated CAD/CAM system with 3-D modeling and finite element analysis capability. The combination of these CAD design tools not only provides us with the capability to optimize the design features of a filter module, they also allow us to integrate our designs directly into our customers CAD design models. 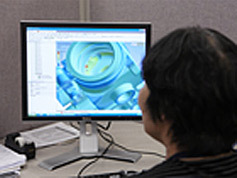 Using ProMechanica FEA and the Blue Ridge Numerics Computational Flow Dynamics (CFD) software, PTI is able to fully model the parts performance characteristics before manufacturing actual hardware, reducing the design risk for PTI and our customers. We employ the integrated product team (IPT) approach in the design, development, qualification and production introduction of state-of-the-art filtration systems. This method, results in improved reliability, lower costs at program start up and fosters ownership among those involved within a given program.